The temple complex with consist of a cultural centre, conference hall, cafeteria as well as a medical centre. The Buddhist complex will comprise of a cultural centre, a conference hall, a not-for-profit canteen and a large medical centre, Interfax-Religion said, citing the Vesti (Kalmykia) TV channel. In 2006, a ceremony for laying the symbolic stone for the future construction of a Buddhist temple was held in Otradnoye, next to an existing 1990's spiritual and educational complex of Russian traditional religions, including Orthodox Christianity, Islam and Judaism. Attending the ceremony, then-Moscow Mayor Yuri Luzhkov said the temple should be an “appeal for goodness and a unity of our society". The construction should have been completed in 2008, but it never began. In 2008, Luzhkov and the head of the Tuva Republic Sholban Kara-ool signed an agreement on the construction of a Buddhist temple and a Tuvan cultural and shopping centre. This agreement on trade-economic and scientific-technical cooperation, according to Luzhkov, was a continuation of a similar document drafted in 2006. The temple had to complement the memorial complex at the Poklonnaya Hill, where there is already an Orthodox church, a mosque and a synagogue. Plans were on to build a stupa on the hill. The Buddhist community representatives stated at the time, that if the stupa is erected on the Poklonnaya Hill, it would become a symbol of the whole universe and will have a positive effect on the surrounding environment. There is still no information regarding this project’s realization. Russia’s Buddhist community mainly comprises of Mahayana followers from internal republics like Buryatia and Kalmykia. 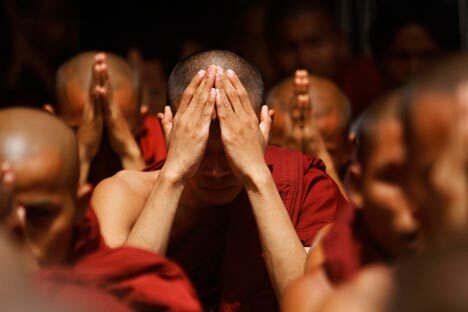 Several ethnic Russians have also embraced Buddhism and are followers of a Danish monk called Ole Nidhal. A small but growing number of Russian pilgrims visit the Buddhist circuits in India’s Bihar, Uttar Pradesh, Madhya Pradesh and Lumbini in Nepal, which is the birthplace of the Buddha. First published in Russian in Newsru.com.